Lower taxes, fiscal stimulus, and dismantled business regulation: That was the magic mix that most everyone agreed would give a quick boost to stocks this year. Alas, six months have passed and there is little hope that any of it will take place anytime soon. Beset by scandals and investigations, the Trump administration has not come up yet with a coherent vision for taxes, has made no progress in formulating a new infrastructure policy and has been unsuccessful at pushing health care reform. Yet, and most remarkably, the stock market keeps holding on to gains made on expectations that, at best, are receding far into the future. To some analysts, this makes stocks vulnerable to a crashing return to Earth. Whether such a crash is likely, nobody knows. Stocks are always at risk of sudden and sharp declines simply because that is the nature of the market. Stocks behave like “non-linear dynamical systems” – unpredictable processes subject to violent changes after periods of calm. The non-technical public has a better name for those jolts: black swan events, named after the zoological upheaval caused by the discovery of black swans in the 18th century, defying the thus-far certainty that all swans were white. Sometimes there are well-defined reasons for a market drop, such as stocks lost more than 10% right after the United States lost its “AAA” credit rating on August 5, 2011. Other times the reasons are not obvious, such as on October 19, 1987 when stocks lost more than 22%—still the biggest one-day fall in history, and it remains largely unexplained. An intriguing pattern that has lasted more than 70 years may offer some clues about the medium- to long-term outlook. It goes like this: Whenever stocks had a lackluster performance in the previous 17 years, as is the case today, they went on to average a very high annual return for the next 17 years. If history repeats itself, the rally may have quite a way to go before the current rally is officially over. 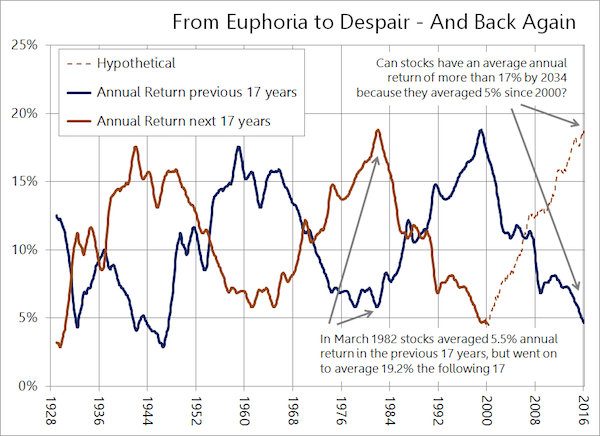 After the strong returns of the last eight years, one would think investors should be euphoric, but it is clear they are not. We are nowhere close to the kind of elation that reigned in the late 1990s, for example, when every taxi driver had a stock tip and day-trading sounded like a reasonable way to make a living. Investors today may not be in despair, but are not high-spirited either about where they think stocks are headed next. This suggests that the market still has good upside potential. An average of 15% per year between 2009 and 2026 or longer would not be unprecedented, as the graph shows. Can the market fall hard anytime soon? Of course, but that means little about its long-term prospects. The crash of 1987 happened as the market was well on its way to climb tenfold between 1982 and 2000. Likewise, the market can crash 20% or more and still average 15% or more between now and 2033. Approaching investing with caution is usually the best strategy, because a steep fall can be devastating to the long-term prospects of any saver. But there may be reasons to believe that sentiment (and demand for stocks), still has significant room for improvement in the coming years, especially if the “magic mix” of lower taxes, fiscal spending and slashed regulations we alluded to ever comes to pass. Long-term prospects for the stock market seem as good today as they have been in a while.